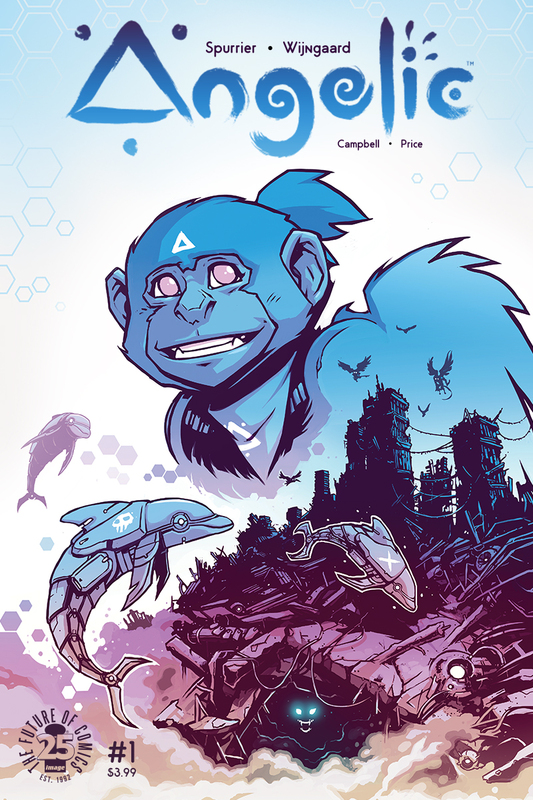 "As awesome to adults as it is to younger readers" – Si Spurrier & Caspar Wijingaard talk new series 'Angelic' – AiPT! 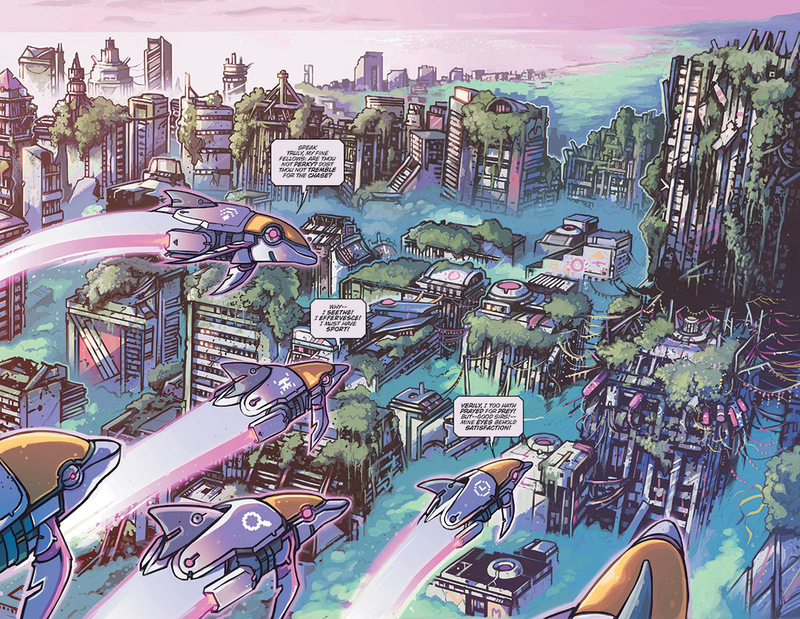 Angelic is being billed as WALL-E by way of Watership Down, which reminds us Image Comics is at it again, embracing ingenuity and creating incredible new worlds. Well, not Image exactly, as Si Spurrier and Caspar Wijingaard are the creators behind this interesting new series. These two creators are aiming to deliver a science-fiction dystopic tale you won’t want to put down. Spoiler alert: We’ve seen the comic and can attest, it’s incredibly unique. 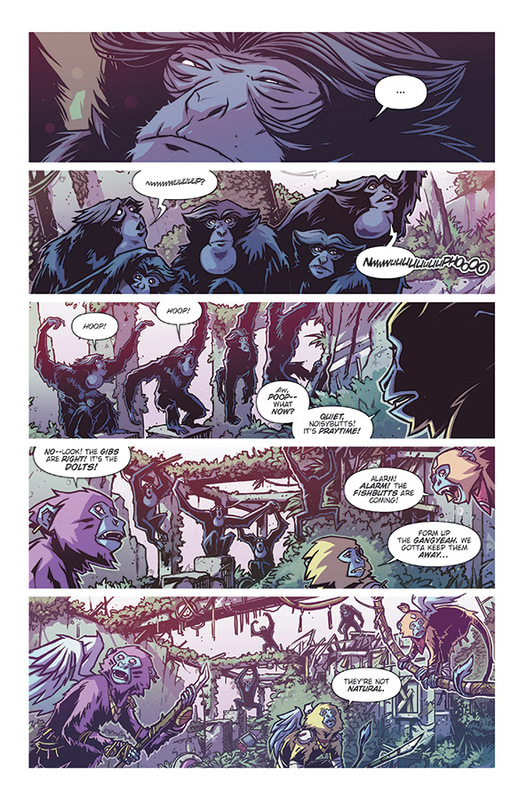 On top of that, we were lucky enough to get a chance to talk to Spurrier and Wijingaard about the comic itself (which comes out September 20) and we were able to break down what the project is about. AiPT! : How did you two connect on this project? Si Spurrier: I’d been blown away by Caspar’s work on Limbo, and basically hustled the poor guy to set up a new project. “Hustle,” in this case, meaning an orbital artillery barrage of ideas, in the hopes that one of them would hit him hard enough that he couldn’t say no. So it was with Angelic. I tend to keep a lot of ideas on standby, for precisely this sort of situation. Some are pretty well-developed, just waiting for the right timing for scripting to start. Others are far more inchoate – often just scraps of thought, or a package of fascinations all bundled together. For that sort of idea the best you can ask for is an artist with an active interest in co-developing the world and the story. That’s what happened here. Of the ideas I pitched Angelic was the least solidified, so we’ve fine-tuned it together. There’s a great situation now where I couldn’t honestly tell you how much of what’s on the page comes from my keyboard, and how much from Caspar’s pen. There are significant plot-points which arose solely because of things Caspar’s unexpectedly drawn. That’s a really exciting state of creative collaboration. AiPT! : You’re given the chance to pitch this to a director/studio – who is that director/studio and what is your 30-second pitch? Spurrier: It’s Wall-E meets Watership Down with a sprinkling of The Handmaid’s Tale. Which is to say: it’s a delightful all-ages adventure about sci-fi animals in a post-apocalyptic future, which – just beneath the skin – is also a delicately-handled fable about growing up in a repressive culture, religious expectations and adulthood. Oh, and the main character is a monkey with wings. Mankind’s gone. In the poisonous remains of our abandoned planet the only things that even look like civilization are the leftovers of our bad science. That is to say: animals, genetically engineered for a war none of them remember. Cybernetic dolphins, energy-blasting gibbons and a whole tribe of flying monkeys living on skyscraper rooftops. And that’s just in the first three pages. Our heroine is Qora – one of those flying monkeys. She’s young, quizzical, brave, curious, rebellious, so it’s her misfortune to’ve been born in a tribe that punishes all of those things. All she truly wants is to explore her world and have adventures, but instead there are some horrible things looming on Qora’s horizon. Rites of adulthood which will literally cost her her wings. So she flies away. And that’s how our story starts. AiPT! : The voices of the characters are so different from each other (the dolphins are a favorite of mine). How do you get into the voices, and for that matter, how did you come to select a type of speak for each animal type? Spurrier: With regard to using animals, it’s a pretty old storytelling trick. Essentially we’re using them as surrogates for a sense of wonder and innocence which is inherently childlike. And, since we’ve all been children – or still are – that’s universally relatable. Some of the best sci-fi presents familiar worlds or ideas through altered perspectives, showing us new ways of seeing things, and “out of the mouths of babes” (or indeed of winged monkeys) is a powerful example. The beauty of dealing with characters who are inherently childlike – vivacious, curious, quarrelsome, often cruel, always full of wonder – is that it helps Caspar and me fulfill our biggest ambition: to tell a story which is as awesome to adults as it is to younger readers. Often in comics we use “all ages” as a euphemism to mean “it’s for kids”… for Angelic we really do mean it. We’ve adopted a very layered approach, inspired largely by movies like Wall-E, The Iron Giant, Kubo and the Two Strings, etc . Young readers should be able to delight in the adventure, the spectacle, and the simple joy of a brave little monkey trying to get away from a really nasty future. Older readers get all of that, and – if they care to see it – a lot of themes and humorous moments that might go over the little ones’ heads. That’s a pretty major departure in approach for Caspar and me – and for Image itself, really – but from all the feedback we’ve seen so far it’s worked really well. Super proud. Why these animals specifically? Well… there’s an author’s note in No. 1 with an anecdote about Why Monkeys which I won’t spoil here, it’s rather lovely, but the short version is that they’re the epitome of the “kids playing at grownups” vibe I wanted. Watch a troop of monkeys for any amount of time and I defy you not to be reminded of a kindergarten class. When it comes to their voices, that’s really the major inspiration. I’ll come back to specific language later – all those lovely neologisms! – but when I sit in my office reading their dialogue aloud (as I do with all comics text) it’s very much channeling my inner rugrat. AiPT! : The world is so well put together, do you have dossiers on animal groups, histories written out, maps maybe (oh I do love a good fantasy map!)? Spurrier: I know Caspar’s reference-resources are very well developed, but from a story perspective, not really, no. My sense is that on a long enough timeline, genre fiction will always tend – by some dark gravity – towards background detail. It can’t help it. Maps, world bibles, that sort of stuff. The intention with Angelic is to just roll and roll in the ongoing mold, so we’ve deliberately given ourselves as much wiggle room as possible from the starting-gate, operating in one limited corner of this world, so that we can be as creative as possible moving ahead. The one slight exception has to do with the history of this world. One of the big questions in this first arc is about precisely what happened, centuries before, to cause the world to be the way it is. So we obviously had to approach this story knowing all that stuff ourselves. War! Calamity! Secret intrigue! Gigantic squids! Caspar Wijngaard: I actually had a fair amount of time to build this world visually, we pitched the book back in April of 2016, however, I was unable to start development right away due to a prior work for hire series I was then working on. I spent a lot of my spare time imagining what the world of Angelic and the creatures that inhabit it would look like, making small notes and sketches, designing attire and tech. I was desperate to put these ideas down on the page, so once I was free to start production I really just let rip. AiPT! : What fun you must have had designing these creatures (and their ability to get around), Caspar! I particularly love your design on the dolphins. What inspired the animals’ types of mobility, let alone the look? Wijngaard: The Dolts were described by Si as dolphins with jet packs, I don’t think they were initially going to be as tech-heavy as my design but I really wanted them to appear to be the polar opposite of the monks. The monks are organic and analogue, where the Dolts are and artificial and automatic, these themes are true with other creatures we meet during Qora’s journey and the dolts are really the foot of the mountain in terms of creature design. We really tried to outdo ourselves each new species introduced and its been fantastic task to undertake. AiPT! : This is one of those works where you could swear this was probably in one of your drawers for two decades marinating, so I ask you, how long have you been withholding such an original and fun series from the world!? 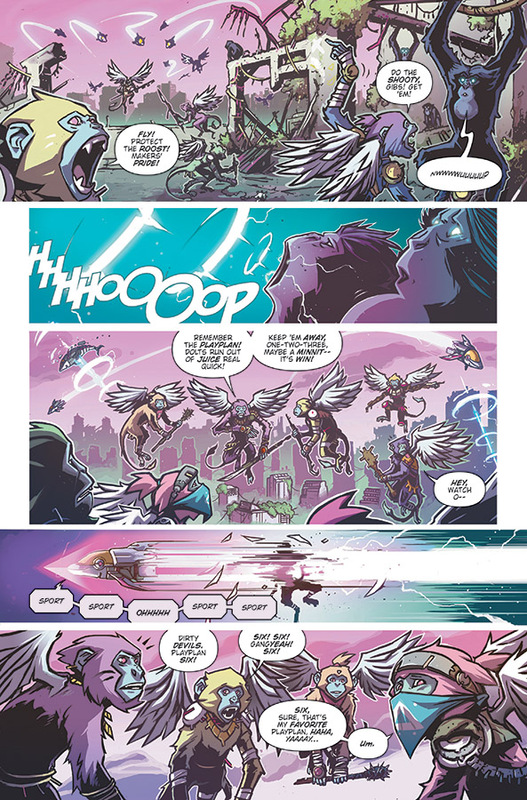 Spurrier: Ha, no, unlike a lot of the ideas I keep on file, Angelic was quite vaguely defined when Caspar and I started thinking it through. I mean, it’s worth saying – as a general sort of thing – for me ideas don’t usually strike fully formed from out of nowhere, but accrete gradually from bits and pieces of fascination, theme, or observed life. That’s particularly true in Angelic’s case. I guess what I’ve always found most compelling about it – as a high concept – is that it gracefully mixes up a bunch of things I’m obsessed with which wouldn’t otherwise feel like obvious bedfellows. Religion, winged monkeys, technowar, science, insane alleycats and the creation of new myths. It’s like one of those 2 a.m. moments after the pub: “I want a cocktail, what’ve we got in the booze cupboard? POUR IT ALL INTO A POT.” Like, you look at the list of ingredients and it really shouldn’t work, but every now and then you step back and – ooops – you’ve invented the banana daiquiri. AiPT! : There’s quite a lot of fun name-calling. How do you approach the creative process of inventing new lingo? Spurrier: Honestly, neologism comes to me quite naturally. It’s taken me most of my life to realize that’s not normal for everyone. Alan Moore uses speculatively-evolved syntax an awful lot in his works, for instance – Halo Jones, Crossed +100, the “Lucy Lips” stuff in Jerusalem – but up until lately it always slightly mystified me when other readers complained of it being impenetrable. So the challenge isn’t so much coming up with this sort of thing, but reining it in enough that an in-world syntax is present without being impenetrable. The sort of invented terms you get in Angelic are pretty indicative of childishness too, which fits with the “through the eyes of youngsters” vibe I was hinting at a moment ago. Kids are great at understanding a phrase without having accurately heard the exact words, so they come up with a Best Guess term to fit the gap. Believe it or not, there’s a name for this sort of creative language: it’s called “analogical reformation.” The example I always give is the word “crayfish.” When medieval English speakers heard their French speaking overlords talking about these weird crustaceans they loved to eat – called “Ã©crevisse” – they misheard it as “crayfish”, despite the spiny bastards being neither fish nor cray. Same with the monkeys in Angelic. Their childlike language has evolved over the centuries to alter, adapt and misuse adult terms, whilst retaining their broad meaning. So anything out-of-bounds is referred to as “the outer bounds”, while someone naughty is a “nobedient,” and a thoughtless heretic is being “sinfool.” For my money, this sort of thing is one of the most powerful tools in a writer’s worldbuilding kit. It makes readers feel like they’re stepping into a fully formed, functioning world. Familiar, but different. AiPT! : Si, forgive me but I must ask, you were probably about 8 years old when the Dark Crystal movie came out. Can you describe your reaction when you were approached to work on the comic? Spurrier: God, no, I think I was 1 when it came out. I’m younger than I look, sadly. Still, I think I probably saw it for the first time when I was about 8 – one of those VHS “hey, it’s got puppets in it, it must be for kids” rainy Sundays that my parents probably lived to regret – so that still tallies. Frankly, it’s remained one of my favorite films ever since. Scary lizard-bird-monsters and all. Its singular approach to fantasy – specifically how it utilizes childlike wonder and horror as narrative drives – is probably the most formative influence on my own worldbuilding process. So, yeah. There aren’t many gigs out there that I literally can’t say “no” to. This was one. Bit of a dream come true. AiPT! : We see a few different animal types in this first issue, is it safe to say there will be more in every issue (and will they all have some form of transportation built into their bodies)? AiPT! : What is your favorite method of procrastination? Spurrier: Honest answer: I make sushi. I spend most of my life staring at a screen and “working” (haha) by making s--t up. The chance to create something using one’s hands, especially something small and fresh and painstaking and perfectly presented, is a really good way of unwinding. That one can do so and have a delicious meal at the end of it really is the perfect trick. Wijngaard: Spending time with my family. My 3-year-old daughter loves to join me when I’m drawing, which is always nice, there are a few pages of Angelic that she’s added her own little brush stokes on. When I finish up work for the day and after the rest of the house has gone to bed, I usually try and sneak in an hour or so of video games. You can preorder the comic by clicking the link below! Game of Thrones: Which of Daenerys’ foes must be vanquished first?